Thank you for reviewing Oi Ocha Green Tea Powder 40g. All valid product reviews are entered into our monthly draw to win a $10 gift coupon for Japan Store - Good luck! Please focus on the item itself. Your review will be most helpful if you include the specific reasons why you either liked or disliked the item. What would you have wanted to know before you purchased the product? Reviews should only relate to the product in question, please refrain from posting about your experience with Japan Store. If you want to share your experience with us, please contact our Customer Services. Please enter a title which summarises your review, e.g. "Just what I needed". Please don't use the name of the item. 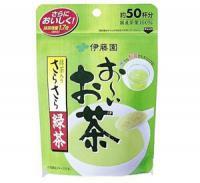 Your review of "Oi Ocha Green Tea Powder 40g". Your rating of the product, out of 5 stars. Comments that defame anyone or violate the rights of any third party, including reviews that are not your own original work. Comments that are not related with the item that was reviewed. E-mail addresses, phone numbers, physical, postal or Internet addresses (URLs), or any other personal information. Pricing and availability information, advertisements or promotional material for other items or alternative ordering information. Customers under the age of 13 are not allowed to post their name or any personally identifiable information. Please notice that our team will usually review all customer reviews within seven business days. We reserve the right to delete, not publish or edit reviews in order for them to comply with these guidelines. By submitting a review, you grant Japan Store and its sub-licensees the royalty-free, perpetual, irrevocable right and license to use, reproduce, publish, translate, sublicense, copy, and distribute the content in whole or in part worldwide and/or to incorporate such content in other works in any form, media, or technology now known or hereafter developed for the full term of any copyright that may exist in such content.